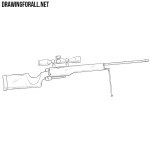 On our site there is a huge number of drawing lessons about the most different types of weapons, mostly cold weapons. 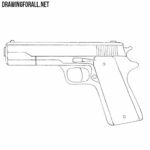 We decided that we needed to create drawing lessons about various types of firearms. 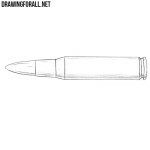 On drawingforall.net we already have drawing lessons about a gun, grenade and a snoper rifle, and today we created a tutorial on how to draw a shotgun for beginners. In order for our shotgun to be smooth and symmetrical, we sketch out the main outlines of the weapon with the help of very light lines. As you can see, here we sketched out a barrel and stock. 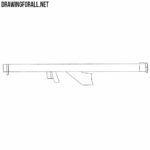 Now, using the same light lines, we sketch out the outlines of the most important parts of the shotgun, such as a forearm, trigger, trigger guard and a loading pot. In the previous steps we used very light lines. In this step, using neat and dark lines, carefully draw out the front part of the shotgun, gradually removing unnecessary guidelines. Now we will do about the same, but with the back part of the shotgun. That is, we need to draw out all the remaining details, also gradually removing all the remaining guidelines from the shotgun drawing. 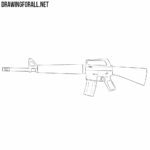 This lesson is not accidentally called how to draw a shotgun for beginners, since we used fairly simple lines here and did not even add shadows. 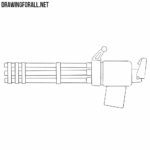 But in the future we want to show you a more complex and more detailed lesson about how to draw a shotgun, so stay in touch and visit drawingforall.net as often as possible.